London mayor Boris Johnson left a House of Commons inquiry midway through answering a question after labelling criticism of him "pathetic". The Transport Select Committee is looking into the travel chaos which followed heavy snowfall on 2 February. Mr Johnson told the committee the difficulties in London were no worse than in the rest of the UK. He added: "It is not within my competence to stop the biggest downfall of snow we have had... for 20 years." The mayor had agreed to give evidence to the inquiry for 40 minutes and, with the time up, he left partway through giving an answer. 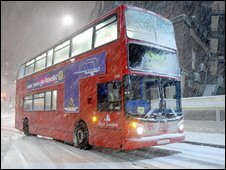 London's heaviest snowfall in 18 years severely disrupted transport, leaving very few buses and Tube lines running. Committee chairman Louise Ellman, Labour MP for Liverpool Riverside, said that MPs were extremely concerned that "our capital city was virtually shut down in a way that did not happen in any other city in the country". She said to Mr Johnson: "It appears that you didn't act in accordance with your responsibilities as mayor and as chairman of Transport for London." The mayor said that Mrs Ellman's statement was "quite wrong", and added: "This smacks to me of an unnecessary amount of party political bias. "To say that the situation in London was worse than anywhere else is simply not true. "The people responsible for transport in London, those getting the buses and Tubes out, actually did an outstanding job." Mr Johnson said there had been 30 road accidents before the decision to halt bus services had been taken at around midnight on 1 February. "I would ask the committee to consider just how many accidents you would like to have seen?" he added. Mr Johnson said "huge effort and huge preparations" had been made to grit roads but snow had fallen on the grit and the compacted snow had made conditions even more difficult. While being questioned by David Clelland, Labour MP for Tyne Bridge, Mr Johnson said: "This is pathetic. You are trying to put the blame on a Tory mayor." Earlier Greater London Authority transport committee chair Val Shawcross said Transport for London (TfL) had not made the mayor aware of the extent of the problems until 0600 GMT on 1 February. "You would normally expect a leader in his position to be in amongst it to ensure things were being carried out as they should," she said. "I personally found it quite strange that the mayor had not been proactive." Ms Shawcross added: "The mayor seems not have been actively involved. It's fair to say that he seemed to be entirely out of things." 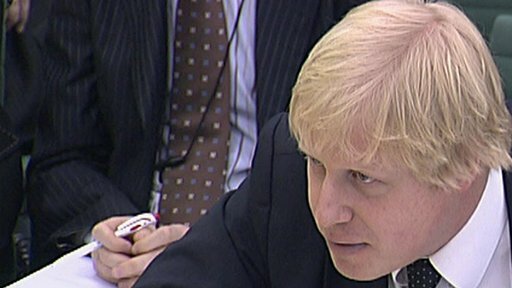 The committee asked Mr Johnson what action he had taken before he was made aware of transport problems on 1 February. The mayor replied: "I observed that it had started to snow." Last month a London Assembly report found the city was ill-prepared. The Assembly found a lack of communication and support between emergency services, local councils and TfL.